Tupperware Treasure Box is now available for purchase! The Tupperware Treasure Box is one of the starter kits that you can purchase when you first join as a Tupperware member. If you miss the opportunity to purchase one during application, that’s it! 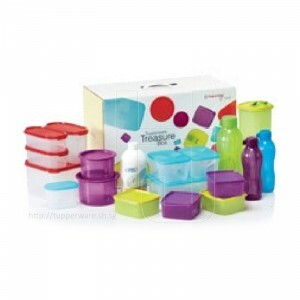 We are proud to bring to you limited quantities of the Tupperware Treasure Box worth (Worth $221.50) at only $150! The Treasure Box is a great gift for House Warming as it contains items that most households would need when they move in to a new place. If you have not and would like to join as a Tupperware member, take this opportunity to get this at $130 and your membership fee of $35 is waived! What’s in the Treasure Box? Get the Treasure Box at our Online Shop now or WhatsApp us at 90242048 for membership application! Please click the button below for the July 2015 catalogue for Tupperware Singapore!